This journey of faith leads the inquirer towards a lifelong commitment as a disciple of Christ, and if he/she so chooses, becomes a member of the Catholic Church. Participants grow in faith together, are welcomed into a community of believers through special Rites, experience prayer and liturgy, and the importance of good stewardship. The Rite of Christian Initiation of Adults (RCIA) or The Rite of Christian Initiation of Children (RCIC) is the Catholic Church's way of initiating new members. It warmly welcomes new members and tries to provide an appropriate spiritual formation for each inquirer. Most Catholics are born into Catholic families and gradually come to share in the full sacramental life of the Church. Others, previously baptized in other Christian Churches, have become Catholic by making a solemn profession of faith, being confirmed, and sharing in Eucharist with the Catholic Community. Some, never baptized, have been initiated through a process that leads to Baptism, Confirmation and Eucharist at the Church's annual celebration of the Easter Vigil. The RCIA is not a class or program. It is a process of conversion. It prepares one to embark on a journey of faith that leads to a lifelong commitment as a Catholic. This is not just for those who participate in the RCIA. All Catholics are called to daily conversion and renewal - to be on this faith journey. The usual length of preparation is approximately one year. Some people may feel they need more time to prepare. 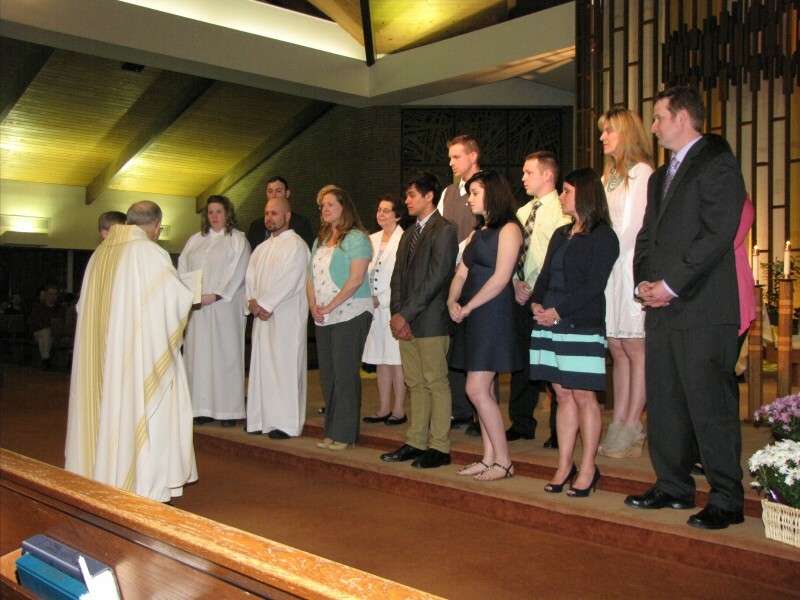 In most cases, the initiation of new members is celebrated at the Easter Vigil. What takes place in the RCIA? The RCIA involves 4 stages, each marked by a special ritual celebrating the person's deepening desire to say "yes" to living the Catholic faith. The Inquiry - a time for searching for God, for meaning in life, or for asking initial questions and seeking answers about the Catholic faith. The Catechumenate - a time of being formed by the gospel and of leaning more in depth about the Catholic tradition. Purification & Enlightenment - a time during Lent of prayer and deeper reflection as one prepares to receive God's new life at the Easter celebration. Mystagogia - a time after the Easter celebration to unfold the mysteries and deepen one's understanding of what it means to "become" Eucharist and live Christ's mission in our world.